With Matt Holliday in the starting lineup for the first time since 2008, the Colorado Rockies defeated the San Diego Padres 4-3 in a fashion that resembled the Rocktober magic of 2007. Down 3-2 in the 9th inning, Ian Desmond launched a two-run home run into the left field bleachers to walk off the visiting Padres. 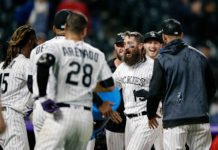 The win over the Padres (50-80) secured a three-game series victory for the Rockies (70-57), who also won 6-2 on Wednesday after losing the series opener Tuesday night. In his big league return with the Rockies, Holliday received a standing ovation from the home fans when announced in the starting lineup. 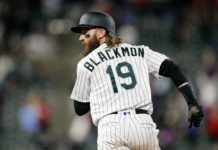 The 38 year-old veteran outfielder went 0-for-3 at the plate but he did launch a ball in the fifth inning that likely would have been a home run if it did not get caught up in the wind. While Holiday’s return was the big headline in Thursday’s contest between NL West foes, the young guys made the difference for the Rockies. David Dahl, who was playing right field, hit a double in the third inning and solo home run in the fifth inning. In the ninth inning, Trevor Story singled with one out and he scored when Desmond hit a walkoff home run two batters later. On the mound, Kyle Freeland delivered yet another quality start for the Rockies. 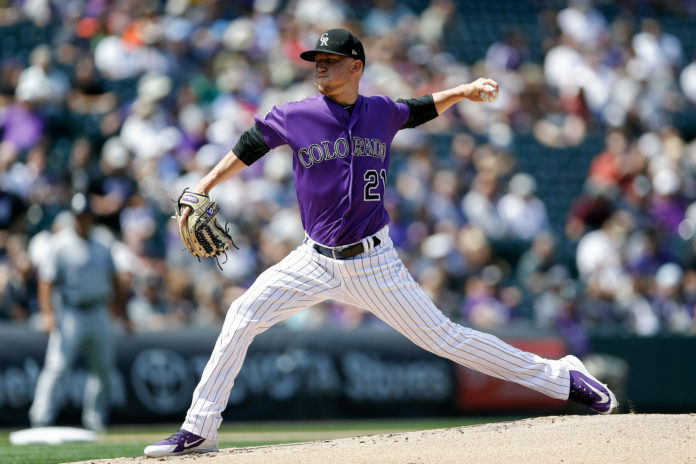 Freeland, 25, has been a stable presence at the top of Colorado’s rotation all season and the second-year starter has been locked in since before the all-star break. In 6.1 innings Thursday, Freeland gave up seven hits and one earned run, while striking out seven and walking one batter. The Rockies will host the Cardinals for a three-game series, beginning Friday. Antonio Senzatela (2-2) will on the mound for Colorado and Miles Mikolas (13-3) will be pitching for the Cardinals. First pitch is currently slated for 6:40 p.m. MT.